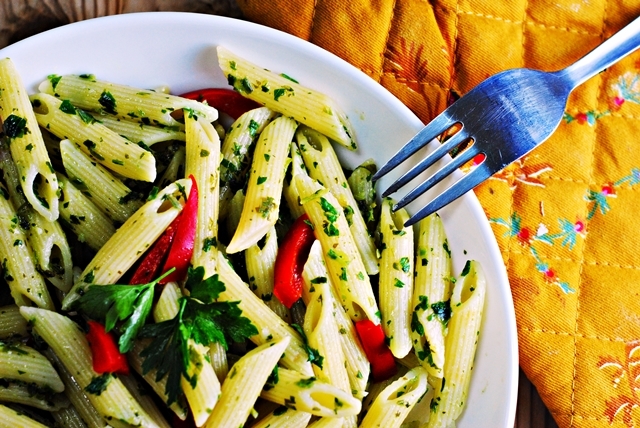 The post whose success surprised you: I was definitely surprised by the overwhelming positive response on Foodbuzz and my blog to No Cook Herb Pasta Sauce. Essentially a nut-free pesto, it’s something I make all the time and couldn’t be simpler, but I suppose that’s the appeal! 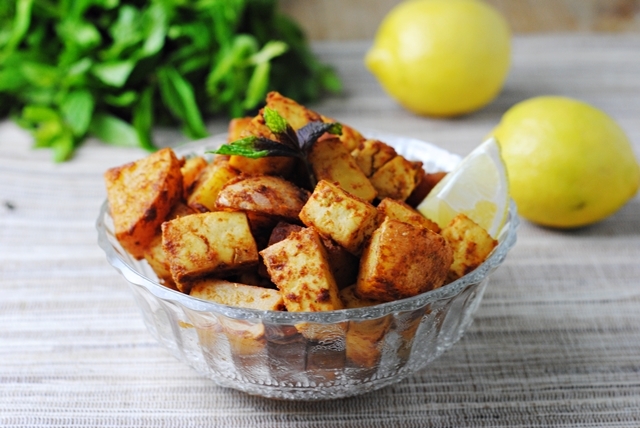 Your most popular post: This could have just as easily gone under post whose success most surprised you, but the post that has gotten the most hits on my blog is Lemon-Dijon Tofu and Potatoes. That’s right, a vegetarian, vegan, gluten free, parve TOFU dish got the most visits. I say this with such surprise because every time I post a tofu recipe I get a number of comments from people saying either they or their spouse won’t eat the stuff. Your most controversial post: I’m happy to report that there’s been very little controversy surrounding my little blog (those of you who know me know I cringe in the face of controversy or conflict of any kind) but I suppose my post on Where to Shop for Food in Be’er Sheva garnered the most local interest. As a result, there was a bit of an outcry when I declared that there was no good fresh fish in Be’er Sheva. Outsiders were horrified at the prospect, although I maintain that frozen fish is often fresher than “fresh.” I also received a number of comments and emails from Be’er Shevians who shared their favorite fresh fish spots. So it also turned out to be the most helpful post and a learning experience for me. Your most helpful post: I would have to say that Food Photography: A Natural Approach was my most helpful post. I wanted to relay what I had learned in a wonderful food photography class I took over the summer, and I was thrilled that people found it helpful. Although I wrote it nearly a month after the class I was pleased at how much I had retained (with the help of copious notes), and also realized how much information was packed in. The post you feel didn’t gets the attention it deserved: There are plenty of posts from when I was just getting started that got very little attention but I think I’m going to have to go with Curry Puffs. Not a single comment! I love curry puffs and was particularly proud of my homemade version. Check them out. They freeze beautifully! To be fair, the recipe did get a lot of love on Food 52 and was named an editor’s pick, that love just didn’t trickle over to the blog. Your most beautiful post: This is a tough one. Photography, and in particular food photography, is something that I have been actively working on since starting this blog over a year ago and I can say that I’ve seen a definite improvement in my pictures. My pick for most beautiful post goes to At the Market: Fresh Chickpeas for a few reasons. For one fresh chickpeas were a beautiful and wondrous discovery for me and I was so excited to be able to share this. I also like that this post shows fresh chickpeas in various states – at the market, whole, shelled, in a salad, and pan-fried. Also, I’m quite pleased with how some of the photos came out. The post that you are most proud of: This one is a tie. I know! Both are things I had bookmarked for ages, and that I thought would be beyond my ability, and both turned out easier than I thought and even better than I’d hoped. The first is Marak Kubbeh Adom, an Iraqi-Jewish beet soup with meat-filled semolina dumplings. I’ve become obsessed with this comforting soup since moving to Israel and was really proud of my rendition. The second post I’m most proud of was the Potato and Goat Cheese Terrine. The creation of a professional chef, I wasn’t sure I’d be able to pull off this elegant appetizer but I did and it looked impressive. Head on over and check out their wonderful blogs! I love, love these 7 links posts, especially since I’m a relatively new fan of your blog! Great “new to me” recipes and ideas. I’m going to go comment on your curry puffs, too…YUM!!! I do too! It’s always so fun to get these insights into people’s blogs. Thanks so much Liz!! Hi KAtherine! Thanks for tagging me. I had no idea what the 7-links are and I will do it as soon as I can. Is there a time period that I have to complete it in? I am very interested in trying that beet soup! Have to put that on the list! No problem Ilke! It’s just a fun, optional thing and you can do it whenever! I do hope you try the kubbeh – it’s amazing! Thank you so much! 😀 Yes, it’s so fun to reflect on old posts and see what’s done well, what hasn’t, etc. Have a great day! Gosh, thanks for tagging me! This is a really cool idea. And your post brought a couple of posts to my attention (the curry one & the food photo one) that somehow I had missed! You’ve got a great blog – one of my favs. Thanks. Hi Katherine! Nice selections of 7 links! 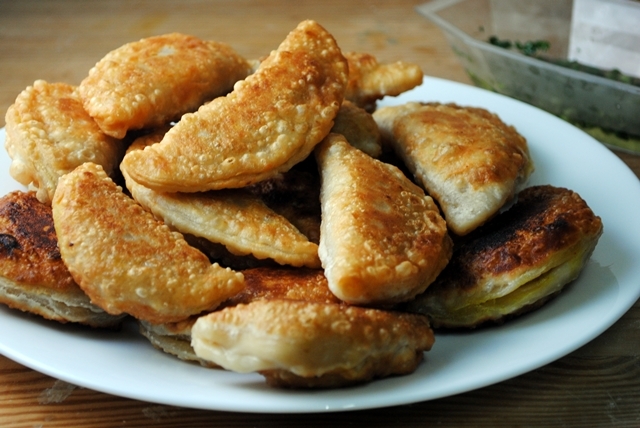 I’m eying on Curry Puffs….They look so good and I love the potatoes are in it!!! Hello Katherine, thank you so much for visiting my blog! It’s nothing like yours, your pictures are so beautiful, I am really glad that I’m here! I love this game of 7 links, I always pay attention to the ones that didn’t get the attention it deserved and those puffs look awesome! Eri, you’re too sweet! I am so glad to have discovered your blog. Thanks so much for stopping by and I hope you have a great weekend! Thank you for sharing these links! I like the idea of Dijon mustard with tofu – when I think tofu, I think Asian recipes, so I think soy sauce. I’ve never added Dijon mustard to tofu, so that is definitely something new to try. Thank you for stopping by Bianca! I was also intrigued by the idea of a Dijon mustard tofu when I came across the recipe that inspired me. You’re so right that tofu tends to show up in an Asian context. I hope you enjoy!